Advantage Finance LLC now offer Title Loans Buyout Program- We will payoff your existing Title Loan and refinance it with our Low Rate and Low Monthly Payments Title Loan. We will be with you through out the easy Title Loan Buyout process. Stuck in a 30 day Title Loan? visit our website https://www.cartitleloanshouston.com for quick quote. 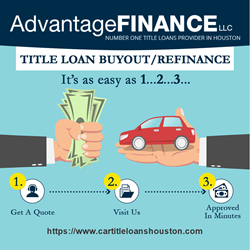 Advantage Finance, LLC a full-service auto title loan finance company, serving Houston and the surrounding areas, recognized a need in the auto title loan industry: to offer consumers an alternative to very short-term and interest only automobile title loans. Advantage filled this need by providing title loan buyouts programs to consumers with principle and interest loans with extended repayment periods. Advantage pays off the consumer’s short-term loan by arranging a longer-term title loan with better terms for the consumer. The payback schedule for these loans includes both principle and interest, which is often lower than the interest on the consumer’s original loan. This arrangement helps consumers by leveling their payments and making the loan’s repayment easier. According to an Advantage official, “We help many consumers who are locked into very short-term title loans; some as short as thirty days. We complete a title loan buyout by arranging for them a new title loan with an extended repayment plan.” In these cases, the repayment schedule includes both principle and interest. They are not interest-only loans. This is a great benefit to people because it both lowers and smoothes out their repayments. Here’s how the program works. A consumer with a very short-term auto title loan (typically 30 days) works with one of the Advantage representatives to complete what is referred to as a ‘title loan payoff.’ Advantage arranges a new title loan with an extended repayment period to pay off the current short term loan. Also, the repayment plan for this new loan includes both principle and interest, often with a lower interest rate. The consumer is helped in two ways: reducing the monthly payments and giving them a more extended period over which to repay the loan. This program is, in effect, a refinance of the original title loan. “It’s a win-win situation for our customers and for us. We’re able to help them restructure their debt, and they can lower their monthly payments and smooth out their repayment schedule. Our goal is to offer a service to the community that is both valuable and fair,” says an Advantage official. The team at Advantage Finance, with four Houston locations, offers the most comprehensive package of auto title loan options on the market today. For more information and to connect to one of our professionals, visit our website.